A&W, what happened to your chicken patty? How come like that wan? It looks like it’s turning into a real chicken! 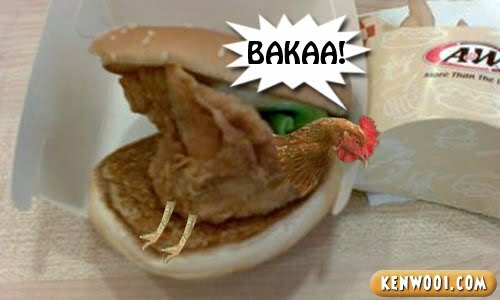 You fail also Kenwooi… WHY EAT CHICKEN BURGER IN A&W?! The coney dog is so good! LoL! U freak! I read until terkejut! Ish… and yesterday only I was at A&W 1Utama! Haha.. chicken comes alive, man! cool! kenwooi dear, one rule when you’re in A&W: ONLY order coney dog and rootbeer.. heheh..
probably the chicken is still alive and is trying to wake up. I guess it’ll eat you back then. Wrong chicken in the kitchen..the chicken did not cross the road instead of travelling in a BMW they landed up in A&W ~;). 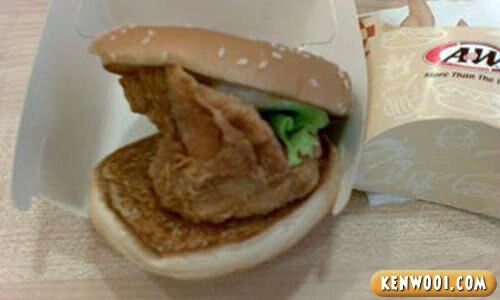 A&W chicken burger? It should be chicken wing burger. cute! the chicken a bit out of shape :P You’ll need ask it to work out. pity u..hahhaa..can u edit the coney dog like your second pics above..wondering how it would be…heheh.. The chicken is so pathetic -.- You should order coney dog next time. Its nice.